If your confidence is at all time low due to an unwanted receding hairline or premature balding, then help is at hand in the form of medical hairline tattooing also known as scalp micropigmentation. As an affordable alternative to hair transplant procedures, this specialised technique addresses the problem of baldness, through the replication of natural looking hair follicles, using a patented state of the art roller method and cosmetic grade pigments created by NPM International. Using an advanced spring system with a cluster of 56 needles which has been designed to create a cross-weave pattern into which a colour matched pigment is implanted, the technology is able to provide a subtle yet highly effective transformational look, which emulates the appearance of naturally shaved hair follicles. 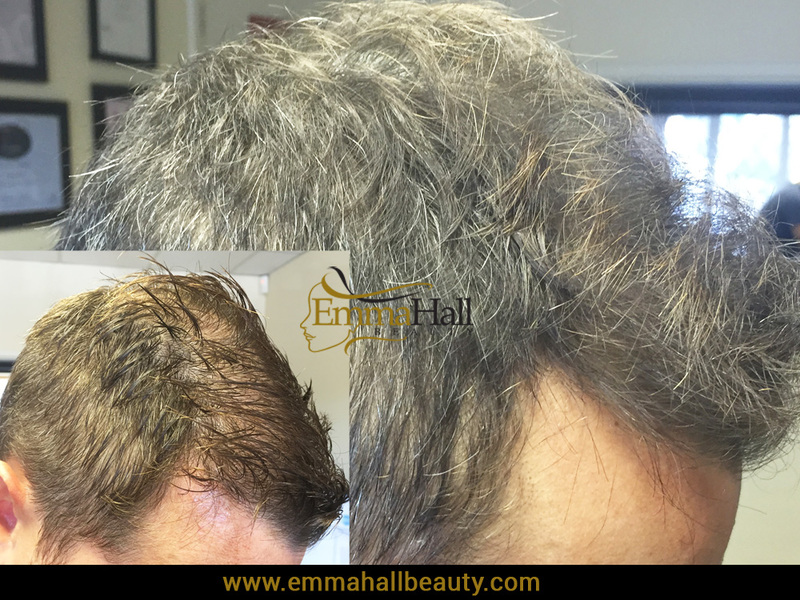 In reality many men will notice a gradual thinning or hair line reduction as they age, with some suffering from a more rapid decrease quicker than others. 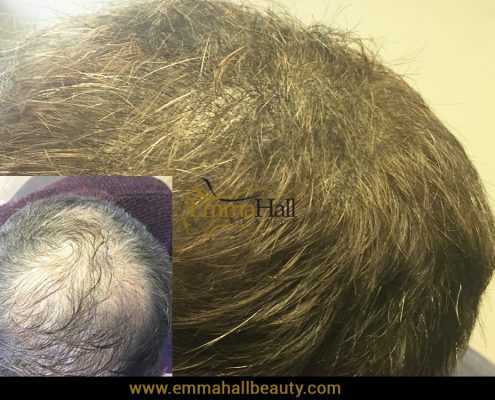 There are a number of factors which may contribute to this ranging from good old fashioned genetics to the use of certain medications, illness, nutritional imbalances or lifestyle choices; however with the invention of scalp tattooing a lack of hair need no longer be an issue which dominates your life. 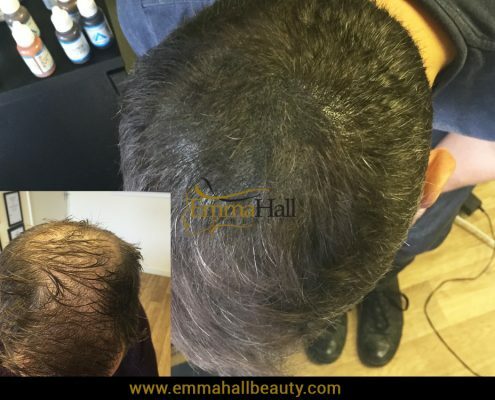 Scalp micropigmentation (tattooing) also known as ‘Hair Follicle Simulation’ (HFS), offers an exciting new way to disguise baldness, a patch of thinning hair or receding hairline. After use of the roller which creates hundreds of tiny illusionary hair follicles, pigments are applied to add colour and shading to the area, resulting in a naturally looking groomed appearance. So effective is the procedure that many clients comment on how colleagues and friends are astounded by the difference that just a couple of treatments make. So if you feel that it’s time to wave goodbye to those irritating feelings of self-consciousness and nightmare inflicting images of fly away toupees, then this non-surgical procedure may be just what you’ve been looking for. Let’s take a look at the treatment itself in more detail by following the three simple steps that I use to turn the clock back to the days when hair was plentiful. After your initial consultation, patch test, hair line mock up and topical anaesthetic application, I’ll start the procedure with a gentle application of light pigment colour. This will provide a very faint initial impression of natural hair regrown and will be barely visible to the human eye. After this first session I recommend a three week break to let the pigment fully settle before returning to the clinic. At the second appointment, I’ll add some slightly bolder colours to give the suggestion of a full head of hair and the illusion of dimension and shading. If you have any scars or problem areas, this is the time which those will be addressed, working them into the newly created tattoo to make them as invisible as possible. After this session, I’ll ask you to return in approximately four weeks, for your final treatment. Now that your tattoo has had time to settle in, I’ll finish it off with one final fill of darker colours and will make any corrections to your hair line by adding specific precision details to ensure that your 100% happy with the end result and ready to embrace a new found freedom and confidence. With scalp tattooing being a fairly new concept, no doubt you have lots of questions to ask. Here are some of the most frequently asked questions, however if after reading through them there are still some topics you’d like addressing, please feel free to get in touch after all the only stupid questions are the ones that you don’t ask. Q. What is scalp tattooing? A. Scalp tattooing is a method of replicating your hair follicles to give the impression of a full head of hair. 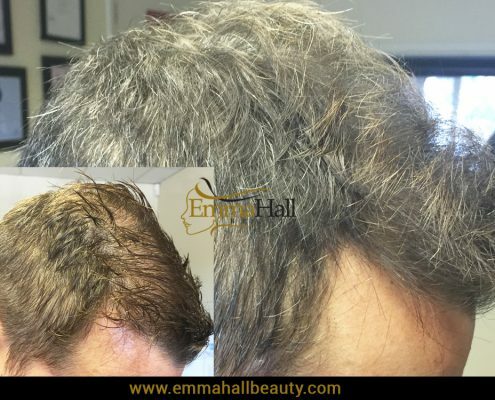 It is a popular treatment with men (and women) who suffer from hair loss and uses cosmetic grade pigments and a series of highly skilled techniques to achieve a flawless, natural finish that you will love. Q. Why is scalp tattooing becoming so popular? A. In the past, the only real options available for men who were suffering with hair loss would be to wear an uncomfortable itchy hair piece, or to have painful, invasive hair implants. Thanks to advances in tattooing technology and pigment manufacturing, we are now able to offer a comfortable and affordable alternative that really makes you look great whilst retaining your image and personal style. A. Yes, scalp tattooing is suitable for all types of baldness, for men and women of all ages, skin colours and hair types. 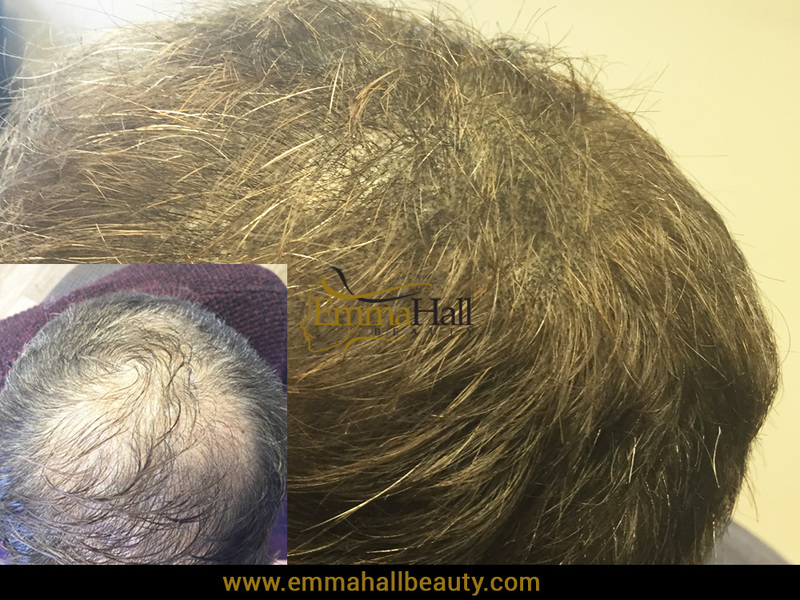 Whether you want to disguise hair loss, cover up a scar or simply volumise your current head of hair, scalp tattooing has the ability to provide first class solutions for your every need. A. Scalp tattoos are intended to stay there for life. The treatment uses a special type of pigmentation which will not fade or go green or blue over time. However, you might want to consider a touch up every year to eighteen months, just to keep things looking neat, tidy and refreshed. 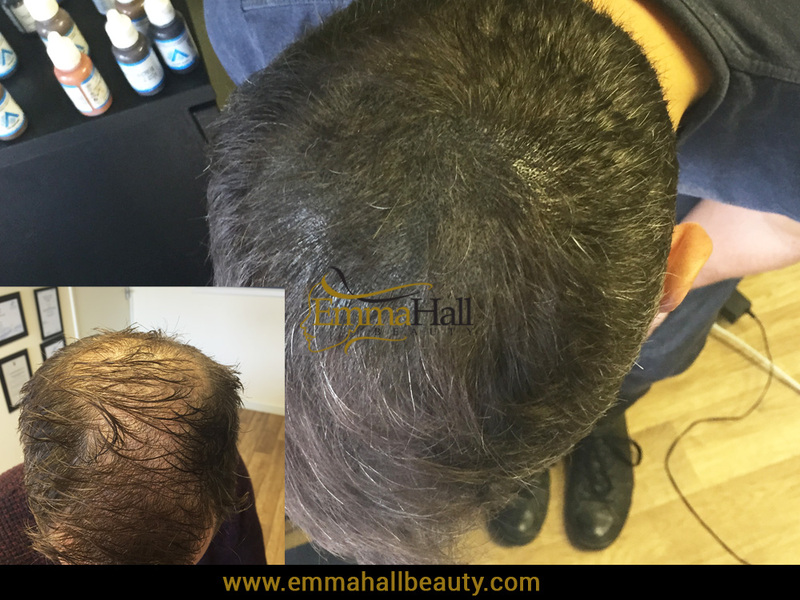 A. Scalp micropigmentation can be perfectly safe when administered by trained professionals, such as those here at Emma Hall Beauty. We use natural pigments to avoid allergic reactions and there are no drugs or medication involved. Our clinic is clean and hygienic, and because the micropigmentation process does not expose your skin to harmful elements, there is little chance of infection occurring. Compared to other treatments for hair loss, scalp tattoos are by far the safest investment. A. The sensation you get when you’re having your treatment could not be described as painful. You might find it irritating, and slightly uncomfortable, but most of our clients barely notice its being done. If you are worried about the pain, we recommend you take paracetamol an hour before your treatment. The good news is that as soon as the treatment stops, any associated discomfort stops; there is no long lasting associated pain or discomfort.